Nice shot of a series of infiltration trenches managing runoff from a roadway. Note the use of open section roadway and a grass filter strip for pretreament prior to the trench. 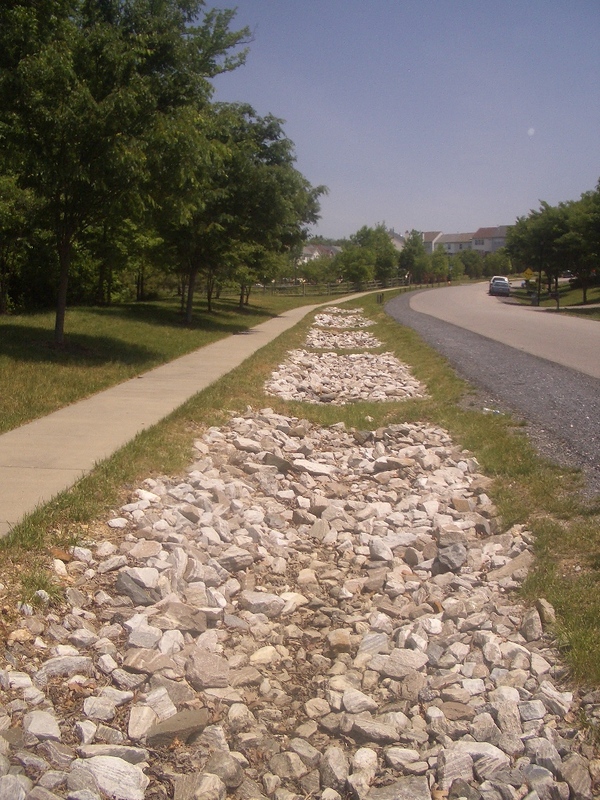 Stormwater is stored in the void spaces between the stone and infiltrates into the ground. Just about the best sustainable stormwater management practice – from a treatment and groundwater recharge standpoint. The site MUST have soils that can infiltrate at least 0.5 inches per hour (other opinions may vary on the numbers) to use this – which eliminates many sites with silty or clayey soils. May not be the best practice from a maintenance and repair standpoint – as the voids can fill with sediment over time and clog the filter cloth between the stone and native soil…. And to repair – it needs to be essentially replaced, which may not be considered to be truly “sustainable”. This entry was posted in Land Planning, Landscape Architecture, Stormwater Management, Sustainable Development. Bookmark the permalink.